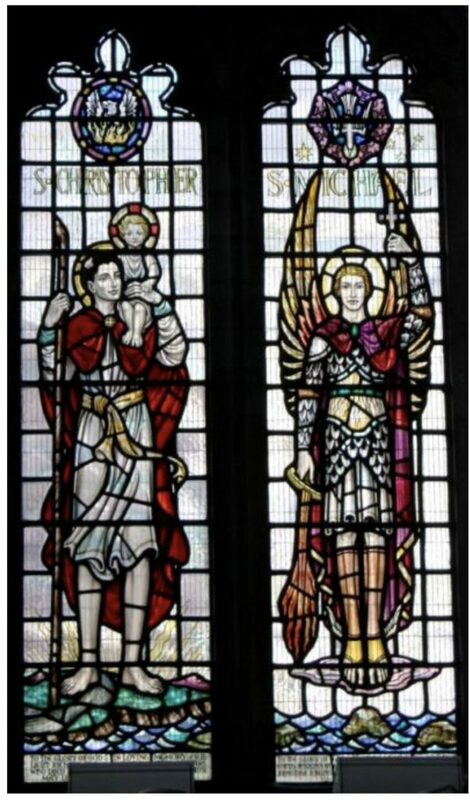 Fay Cuthbertson wrote an article about the St Michael window (North West wall) which was originally published in the HT magazine of July 2011. It is still available on our church website archives section. The photograph above shows the “Jenkins” window alongside the “North” or “St Christopher” window. Both windows commemorate the loss of a church member on active service; Flying Officer Peter Jenkins during WW2 and Sub Lieutenant Richard Frank North who perished in the HMS Affray submarine disaster on a training mission in April 1951. This article is dedicated to the memory of Richard. persons on board is not known, at least to the public, as naval Board of Enquiry reports are strictly confidential. A precis of the report was submiited to the house of commons in November 1951 which concluded that there was insufficient evidence to explain why the submarine was lost. One theory suspected flooding through a broken snort mast whilst another speculated about a battery fire. HMS Affray set off on it’s final mission from Portsmouth on 16th April 1951 with a reduced compliment on board to make room for a group of 26 officers, engineers and Royal Marine commandoes on training. There were a few question marks over the vessels fitness for sea and suggestions that the timetable for participation in the exercise may have been a factor. Once out in the English Channel the “Affray”, as planned, signalled her position and intention to dive at 2115 hours. She was due to make her surfacing signal by 0900 hours the following morning, 17th April, but no such signal was received. There was no immediate response to the lack of a signal and some concerns that a rescue mission was delayed by a few hours. By mid-day a search was underway and several search submarines reported picking up hull tapping and faint intermittant signals but without getting a precise location fix. The last signal was reported by submarine “Ambush” at 1439 hours on the 18th April with code letters which represented “we are trapped at the bottom”. The wreck was not positively located and identified until 8 weeks later on 14th June some 40 miles from the reported diving position and well outside the original search area. One can only imagine the turmoil and distress experienced by those on board and their loved ones waiting and hoping for news. In 1953/54 Diana Jenkins , sister of Peter, had commisioned the St Michael window in memory of her brother and mother and this was dedicated in September 1954. Around this time Mr and Mrs North decided to request permission to add the partner window to commemorate the tragic loss of their son Richard. In our archives there are records of correspondence with our Rector at the time, Canon Robert Denholm, during which the design was discussed and agreed. St Christopher was selected as a Saint revered by Mariners and, as is often the case, he is depicted with a child on his shoulder. The Phoenix was selected to balance the Dove in the Jenkins window and to symbolise the resurrection. Arrangements were made for the dedication which took place in December 1955.